Chuck Wagon owner, Mike Atchley, stands outback at the Chuck Wagon Cafe' in Moscow on October 3, 2013. Atchley cooks all his steaks over wood coals. Moscow Resident Made a Living on the Open Range, Enjoys Cowboy Cooking, MOSCOW, October 4, 2013 - Happiness is a great steak. If you ever drive down US-59 to Moscow (about 15 miles north of Livingston), there's a little restaurant right off the highway called the Chuck Wagon Cowboy Cafe'. There you will find a man who still cooks steaks, over hot coals of oak, mesquite, pecan and hickory; seasoned to perfection. Owner Mike Atchley was born in Livingston. His parents moved when he was a boy and he graduated from San Augustine High School in 1968. Atchley moved back to Polk County in 1975. During his life's travels, Mike has worn different hats. He's ran his own construction company, he's been in charge of actual hunting ranches with exotic big game, he's also been a professional fisherman, but the thing that has defined Mike's life of work more than anything has been his life on the open range. Mike was a real life cowboy who's worked ranches all over Texas (herding cattle and breaking horses). He's traveled all over the USA showing horses (even up in Montana, and Canada), however, his experience on the open range isn't limited to herding cattle, roping calves and riding horses, Mike has a passion for cooking and catering (cowboy style). Atchley loves to cook old school style. "I've cooked for hundreds of people in one setting" he says. "We had dutch ovens and hot wood coals all over the place". Mike has a real chuck wagon that he uses to this day. "Wood is the primary source of heat" Atchley said, "That's not just Texan". "Whether you're from Tuscany or Argentina or wherever, it's a traditional method of cooking", he said. "We use native woods; oak, hickory, mesquite and pecan". "We cook with the coals, which means you take a pile of wood, burn it down to coals, then shovel it underneath the grill". "There's an art to making a good steak", Atchley says. "You have to know how to scorch it". He continued, "What determines the method of cooking is the height of the meat above the coals". "If you're cooking a steak, you want it right above the coals, and I believe in cooking with a little bit of flame, because you don't want a gray steak". "Keep it hot enough so that it sears the outside of the steak and gives you good grill marks and a little char, this adds a tremendous amount of flavor, this really compliments the flavor of your beef". Yeah, Mike knows the art of making a great steak. He invited me up for a ribeye on September 30th, I ordered my steak medium rare. I was blown away by how absolutely delicious my steak was. After that night, for the next three days I kept thinking about that steak and came right back on October 3 (3 days later) and had another 16 ounce ribeye. I have no doubt that I'll be back again soon, but there's so much more to Mike's business. He also prepares pies, cakes, cobblers, bread pudding, biscuits and more, all from scratch every day. Further, Mike has a catering business. 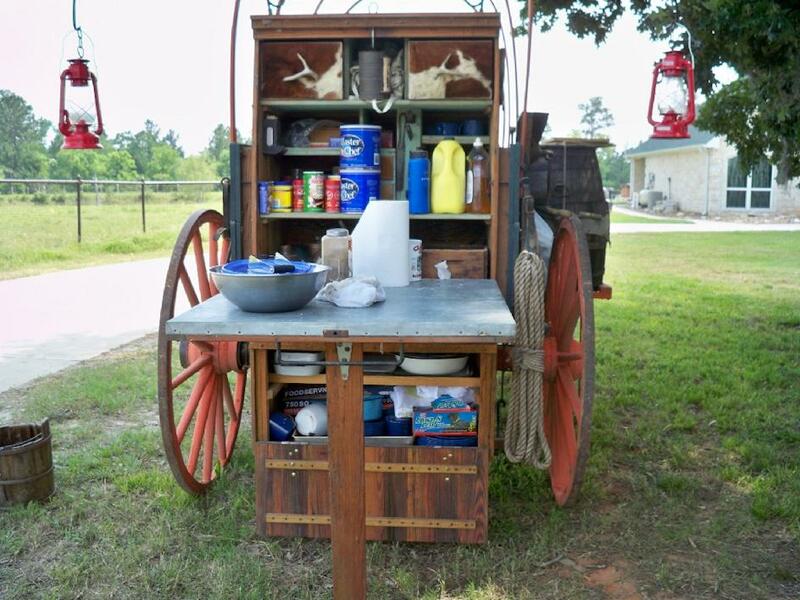 He'll show up at your event with his authentic chuck wagon and cater for your get together. Mike Atchley has a remarkable knowledge of cowboy history. Click here to read some of his writings. Mike seaons each steak perfectly. Desserts are made daily from scratch. Chicken Diablos have a sweet glaze and are very spicy! Your humble editor enjoying a 16 ounce ribeye at the Chuck Wagon Cafe' on September 30, 2013.